COLLECTORZPEDIA: Russia 2016 - History of the World War I. Continuation of the Series. Native Military Equipment. Russia 2016 - History of the World War I. Continuation of the Series. Native Military Equipment. World War I marked the beginning for change in warfare tactics. New types of weaponry and military equipment, such as automobiles, ships, aircraft, automatic weapons and powerful artillery, emerged, and started being used on battlefields. 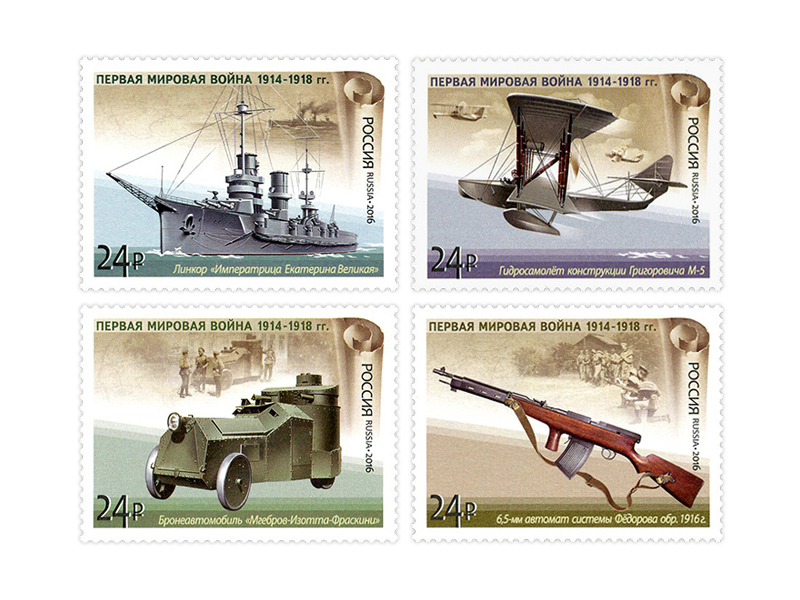 The postage stamps feature the Fedorov Avtomat, the Grigorovich M-5 flying boat, the Imperatritsa Ekaterina Velikaya dreadnought, the Mgebrov-Isotta-Fraschini armored vehicle. Mgebrov-Isotta-Fraschini armored vehicle was developed at the Izhora Plant in 1916. Thanks to sloped armor it boasted increased bulletproof capacity. It was heavily used by both the Imperial Russian Army and the Red Army till 1919. The Grigorovich M-5 flying boat was developed in 1914 and brought wide popularity to its designer. During World War I, it was in active service in the Black Sea Fleet Aviation based in Batumi, Odessa and Sevastopol. The Imperatritsa Ekaterina Velikaya dreadnought was commissioned into the Russian Navy in 1915. She was in active service during World War I. She was renamed Svobodnaya Rossiya after the February Revolution. The Fedorov Avtomat was the world's first assault rifle. It was commissioned into the Russian Army in 1916 and used in World War I, the Russian Civil War and in the Winter War.